Choosing the card stock that best fit your design and intent is important in achieving perfect prints. Thus, knowing the variety of options when printing invitations will be a big help. Here is a guide on choosing the right paper thickness & coating. 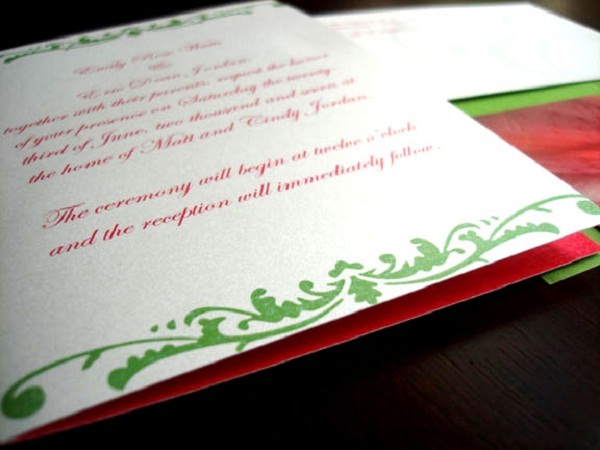 If you prefer thicker invitation cards, there are specialized printing companies that offer 17 pt. card stocks. For folding options, you’ll need to have the card scored. • Gloss – This coating adds shine and makes the colors of your design more vibrant. • High Gloss – Commonly known as UV coating. This makes the design shinier than regular gloss. • Matte – This coating tones down the color of your design and adds a smooth feel on the card. • Textured – You can feel an embossed or extruded patterns on the card. Some common textures are weave, mat, tile, leaf, and clouds. • Scented – There are card stocks that have a pleasant smell for an added feel. You can have your card stock colored, textured, scented or a combination of any or all of the three. Some printing companies offer more choices. Call your online printer and ask for more information.